Cameroon’s Head of State, Paul Biya, may take action towards rebuilding scores of villages which have been reduced to rubbles in the Northwest and Southwest Regions, The Post has learnt. The villages are those destroyed within the context of the ongoing Anglophone Crisis. Information in this light filtered out of an emergency meeting between Chiefs of Meme Division and the administration on Wednesday, April 4 in Kumba. 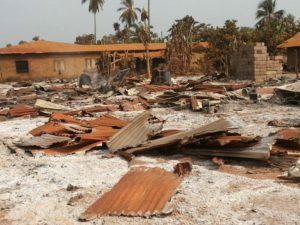 According to the Senior Divisional Officer, SDO, for Meme, Chamberlin Ntou’ou Ndong, an exhaustive list of houses burnt down across his administrative unit will be forwarded to the President of Republic. The Prefect said once that is done, the high directives of President Biya will be awaited on the issue. Making inference to such presidential help in areas such as Shell Creek, Idabatu in Ndian Division, the SDO said such could be applied to the affected villages if Biya decides. He told reporters that as Prefect for Ndian at that time, he lived the importance of Biya’s intervention that changed the beauty of the sea-site settlement after a mishap. Traditional rulers have been tasked to do the identification in their respective villages and forward it to the hierarchy for onward transmission to the Head of State. However, it remains unclear if such help would be applied to Churches, health centres, business premises and other collective ventures that are now in ruins following the crackdown on separatists across Meme, Ndian, Lebialem, Manyu and Kupe-Muanenguba Divisions.